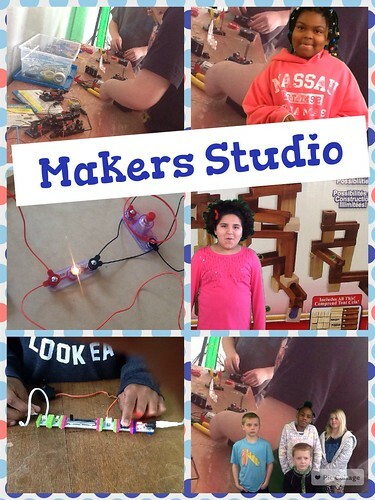 Learn how our third and fourth grade students use their iPads in our maker studio to document their learning and share both inside and outside our classroom. See how apps for photo collages, green screen videos, making ebooks, coding apps, and Lego Stopmotion are essential digital tools in our classroom maker studio for creating and sharing. My presentation for Global Maker Day will be shared as a Google Hangout, which I’m hoping will be recorded so it can be shared later for those who can’t attend live. I’ve created a Google Slideshow for my presentation, which is linked from my classroom website and embedded below. To watch this presentation live, register (FREE) for Global Maker Day and then head over to the Design Google Hangout Room for the conference at 11 am Eastern / 10 am Central / 9 am Mountain / 8 am Eastern time. If it’s available later, I’ll add a link to the recorded video for this session in this post. In addition, I’ll be sharing this as one of my breakout sessions at iPadPalooza 2016 in Austin later in June! Added 5/19/2016: An audio recording of my presentation is available. Added 5/25/2016: The archived Google Hangout video of this presentation is available. I’ve also created a List.ly list of all the iPad apps I’m sharing in my presentation. here in the early hours in the dawn, because i like to learn more and more.